Attention Property Managers, how much of your time is spent tracking down vendors for their Certificates of Insurance? 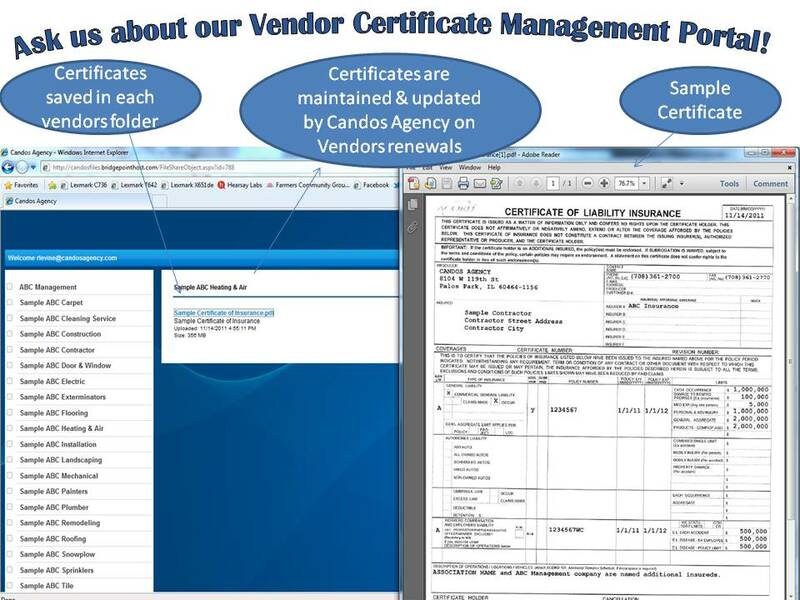 What if I told you that here at the Candos Agency, we manage the information of vendors of your associations for you? That’s right! As long as that particular association is insured with us at Farmers Insurance we will manage the information of vendors associated with that association for you. That means we track them down for the certificates of insurance, will endeavor that they have not only you as the management company listed as an additional insured, but also the association listed as an additional insured. This program has been running for a few years now, which allows us to continually improve on our services for our property managers. As an added bonus we give you access to your own portal where you can upload certificates, or just simply view the different vendors for your association’s certificates, download and print them. We also provide you with a master list of all of the association’s vendor information we manage. This master list allows you to see who has not listed the additional insured status, as well as their current insurance coverage. Want some more information regarding our Vendor Management Certificate Program? Want to login to your own sample portal? Contact us at info@candosagency.com.